Why is sea-level rise important? Around 10m people each year are affected by coastal flooding. A study by the UK Met Office identifies that as populations migrate towards to coastal regions, this will increase to 30m by 2080. The same study suggests that if sea-level were to rise by 44cm (a mid-range estimate) the number of people suffering would increase to more than 100m. In the UK, the replacement for the Thames Barrier and the 300km or so of sea defences that protect London need to be overhauled by 2030. The investment required to protect London against flooding depends heavily on sea-level rise, but could exceed £20 billion. Yes, sea level has risen throughout the past century. Satellite measurements since the early-1990s indicate that today it is rising at a rate of 3mm per year. 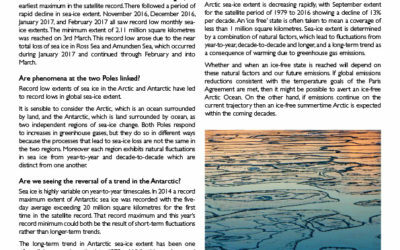 How do ice sheets affect sea level? If glaciers and ice sheets shrink, ice that was held above sea level will find its way into the oceans. If ocean volume increases global sea level will rise. This has happened many times in geological history. Why are ice sheets in the news? For two reasons. Firstly, satellite measurements of Antarctica and Greenland suggest that the ice-sheets are more sensitive to climate change than once thought. Secondly, the Inter-governmental Panel on Climate Change (IPCC) highlighted the issue by suggesting that current knowledge is inadequate to estimate confidently the contribution that ice sheets might make to sea-level rise in coming centuries. While technology makes sea-level rise easier to observe, and we can predict some contributions to future sea-level rise with increasing certainty, we cannot yet fully-predict the ice sheets’ contribution. There is thus a risk that sea-level rise could be higher than the (incomplete) estimates provided by the IPCC. Antarctica is a vast ice sheet, around the size of the USA, and it is not surprising that different areas are behaving differently. On the Antarctic Peninsula, where climate is warming rapidly, 87% of glaciers are retreating but the area is small and the contribution to sea-level rise, a few centimetres per century, is comparable to that from Alaskan glaciers. The East Antarctic ice sheet appears close to balance, although increased snowfall may cause this area to thicken slowly in future. In West Antarctica, there is an area roughly the size of Texas where the ice sheet is thinning rapidly — the Amundsen Sea Embayment (ASE). Close to the coast in ASE, thinning rates are more than 1 metre per year. 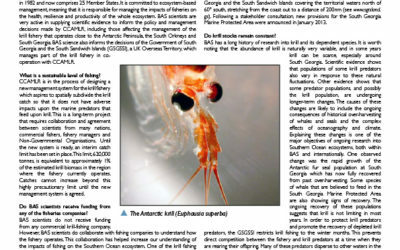 Why is the Amundsen Sea Embayment significant? This is an area that has always caused glaciologists concern, because here the bedrock beneath the ice is a long way below sea-level and the ice is only kept in place because it is thick enough to rest on the bed. Thinning of the ice around the coast could lead to glacier acceleration and further thinning of the ice sheet. 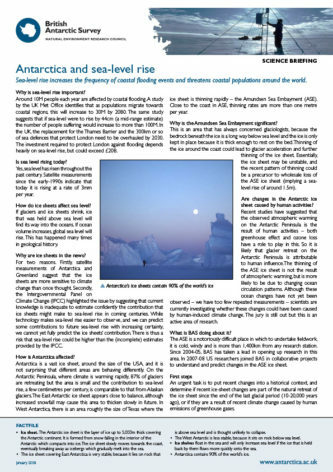 Essentially, the ice sheet may be unstable, and the recent pattern of thinning could be a precursor to wholesale loss of the ASE ice sheet (implying a sea-level rise of around 1.5 metres). Are changes in the Antarctic ice sheet caused by human activities? Recent studies have suggested that the observed atmospheric warming on the Antarctic Peninsula is the result of human activities – both greenhouse effect and ozone-loss have a role to play in this. So it is likely that glacier retreat on the Antarctic Peninsula is attributable to human influence. The thinning of the ASE ice sheet, is not the result of atmospheric warming, but is more likely to be due to changing ocean circulation patterns. Although, these ocean changes have not yet been observed — we have too few repeated measurements — scientists are currently investigating whether these changes could have been caused by human-induced climate change. The jury is still out but this is an active area of research. What is BAS doing about it? The ASE is a notoriously difficult place in which to undertake fieldwork, it is cold, windy and is more than 1400km from any research station. Since 2004/05, BAS has taken a lead in opening up research in this area. 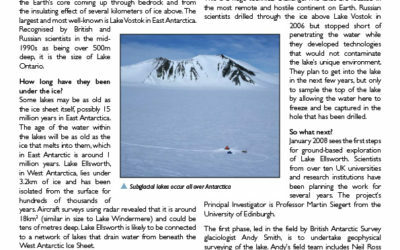 In 2007/08 US researchers joined BAS in collaborative projects to understand and predict changes the ASE ice sheet. An urgent task is to put recent changes into a historical context, and determine if recent ice-sheet changes are part of the natural retreat of the ice sheet since the end of the last glacial period [10-20 thousands years ago], or if they are a result of recent climate change caused by human emissions of greenhouse gases. Ice sheet: The Antarctic ice sheet is the layer of ice up to 5000m thick covering the Antarctic continent. It is formed from snow falling in the interior of the Antarctic which compacts into ice. The ice sheet slowly moves towards the coast, eventually breaking away as icebergs which gradually melt into the sea. The ice sheet covering East Antarctica is very stable, because it lies on rock that is above sea level and is thought unlikely to collapse. 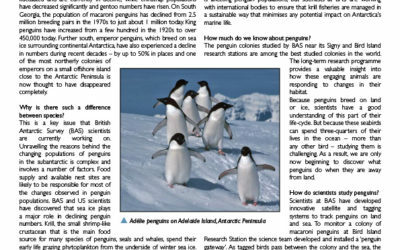 The West Antarctic is less stable, because it sits on rock below sea level. Ice shelves float in the sea and will only increase sea-level if the ice that is held back by them flows more quickly onto the sea.